The All-Star break is a few days away and that means we’re now into the month of July. A great month for trade rumors, it is. Once July rolls around, it means the season is more than halfway complete, the contenders have (mostly) separated themselves from the pretenders, and teams are trying like crazy to address their weaknesses before the July 31st trade deadline. The Yankees went into July 2013 with a 42-39 record and a -16 run differential and were ever bit as mediocre as that record suggests. They closed out June with five straight losses and 13 losses in 18 games. Hug the 2018 Yankees tight, folks. And yet, despite all that, the 2013 Yankees were only four games back of a postseason spot on July 31st. They desperately needed bats. Not a bat. Bats. Plural. Let’s relive the trade rumors and transactions of July 2013. Eight homers! Gary Sanchez hit nine home runs in a span of 21 games earlier this year. The Yankees have claimed Travis Ishikawa off of waivers from the Orioles, an industry source tells Dan Connolly of The Baltimore Sun (via Twitter). The O’s designated the first baseman for assignment towards the end of June. The Yankees released Ishikawa a few days later and, the very next season, he hit a walk-off home run to win the damn National League pennant. Huh. He’s a minor league hitting coach with the Giants now. The Rangers and Yankees are among the teams that have expressed interest in Marlins outfielder Justin Ruggiano. Ruggiano, a 31-year-old right-handed hitter, is at .225/.290/.414 in 273 plate appearances this year. Ruggiano somehow played nine years in the big leagues and he always seemed to be on like three teams a year. He even played in 19 games with the Giants last season. Who knew? The Yankees were desperate for a right-handed bat in 2013. How desperate? Their right-handed hitters hit .220/.282/.309 (62 wRC+) in 1,539 plate appearances before the All-Star break that year. I kid you not. The Yankees never did trade Ruggiano — he wasn’t traded at all that year — who hit .222/.298/.396 (94 wRC+) in 2013. That would’ve made him one of New York’s top righty bats. Goodness. The Yankees consider Aramis Ramirez to be too expensive and they aren’t in pursuit of the Brewers‘ third baseman, CBS Sports’ Jon Heyman reports. The 35-year-old Ramirez was just placed on the disabled list today with a left knee injury, the same knee that has already cost him a month on the DL earlier this season. The problem wasn’t Ramirez’s production — he hit .283/.370/.461 (130 wRC+) in 2013 — or even the knee injury. It was the $24M he was owed through 2014 at a time when the Yankees were trying to get under the luxury tax threshold. Aramis was not traded that year but the Yankees probably could’ve gotten him for a small package given his salary. Alas, the luxury tax plan got in the way. Not sure Ramirez wouldn’t made much of a difference in the grand scheme of things anyway. The Yankees are aggressively pushing trades involving Joba Chamberlain and Phil Hughes, an AL executive tells Ken Rosenthal of FOX Sports (via Twitter). In fact, a deal sending Chamberlain to a National League team could happen soon, though nothing is imminent on either front. This was the first time in a very long time there was an inkling the Yankees were willing to sell. Joba (4.93 ERA and 5.64 FIP) and Hughes (5.19 ERA and 4.50 FIP) were not very good in 2013 and both were going to be free agents after the season. It didn’t make much sense to keep them. Trading them for something, even a Grade-C prospect would’ve been better than losing them for nothing as free agents, which is of course what happened. Joba and Hughes were not traded and did eventually leave as free agents. Prospects will break your heart. Well, not so much lately with the Yankees, thankfully. THURSDAY: The Yankees reached an agreement with Judge on a slightly over-slot $1.8MM signing bonus, writes George A. King III of the New York Post. Judge is advised by PSI Sports Management. So this wound up being a pretty important day, eh? The Yankees gave Aaron Judge an above slot $1.8M signing bonus — they signed all their other players and gave him the remainder of their bonus pool, basically — not long before the signing deadline, and now he’s one of the best players in baseball.
? Drafting and signing Judge was truly a franchise altering decision. There was a lot of luck involved — 27 teams passed on Judge before the Yankees selected him in the 2013 draft, including the Yankees once — but it couldn’t have worked out better. Cuban righty Dalier Hinojosa received clearance from the U.S. government and has been granted free agency by MLB, tweets MLB.com’s Jesse Sanchez. Hinojosa defected from Cuba in February, establishing residency in Haiti, according to a source. The Cubs, Dodgers, Red Sox, and Yankees are among the teams that have shown interest in the 27-year-old, Sanchez wrote in June. Another Cuban player the stupid and cheap Yankees didn’t sign who went on to do nothing. Hinojosa signed with the Red Sox and pitched in one game with them before being lost on waivers. He threw 35.2 big league innings total and has been out of baseball since 2016. The Yankees recently called the Padres to ask about third baseman Chase Headley and, in a brief discussion, were told there wasn’t a deal to be made, sources told Jon Heyman of CBSSports.com. The Padres are willing to listen on any of their players, but Headley appears to be on the edge of untouchable. Hah! The Yankees had been on Headley for a long time before they actually acquired him. That happens more than you’d think. A team wants a player and doesn’t get him until years later. Headley had his career year in 2012, during which he hit .286/.376/.498 (145 wRC+) with 31 home runs, and that season still made him a desirable trade target despite a good but not great .250/.347/.400 (113 wRC+) batting line in 2013. The Yankees didn’t get Headley until June 2014, eleven months after this rumor. They kept at it. Alfonso Soriano is heading back to the same team with which he began his Major League career. After stops in Texas and Washington and an extended stay in Chicago, Soriano has come full circle by officially waiving his no-trade rights to approve a trade to the Yankees. The Cubs will receive minor league right-hander Corey Black in the trade, which was approved by Major League Baseball this morning and later officially announced by the Yankees. The Yankees and Cubs haggled about Soriano for days. It was not an out of nowhere trade. Soriano made it pretty clear he would only accept a trade back to the Yankees, though the two sides needed time to figure out the prospect cost and the money. 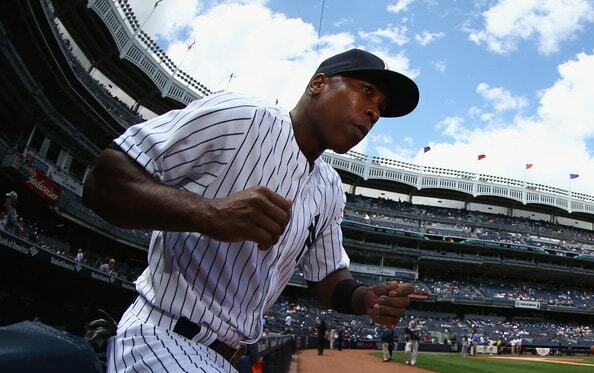 Ultimately, the Yankees paid $6.8M of the $18M remaining on Soriano’s contract. His luxury tax hit in 2014 — the most important number, as far as the Yankees were concerned — was a mere $5M. Soriano came back to the Bronx and was a revelation, hitting .256/.325/.525 (131 wRC+) with 17 home runs in only 58 games. He drove in 50 runs in those 58 games. That’s after hitting .254/.287/.467 (104 wRC+) with the Cubs prior to the trade.
? Things didn’t go so well for Soriano in 2014. He hit .221/.244/.367 (66 wRC+) in 67 games and was released at midseason. I’m not sure if he has an official title with the Yankees, but Soriano has worked with the team’s minor leaguers in Instructional League and Spring Training the last few years. The Yankees cycled through so many generic middle infielders in 2013 and yet somehow Harris never played for them. He went to Triple-A Scranton, hit .233/.356/.315 (98 wRC+) in 22 games, then was released. I guess he couldn’t beat out guys like Luis Cruz and Reid Brignac and Brent Lillibridge for a roster spot. Prior to acquiring Soriano, the Yankees contacted the White Sox to express interest in Alex Rios, according to Joel Sherman of the New York Post (on Twitter). The Yankees are on Rios’ no-trade list and were informed that he would not approve a deal to the Bronx. Rios, however, says he was never approached about accepting a deal to the Yankees, Bruce Levine of ESPN Chicago reports. Huh, I don’t remember this at all. Rios still had quite a bit of money remaining on his contract, so I’m not sure how that would’ve worked out, but it does make sense. The Yankees needed a righty bat regardless of position and Rios was available. The White Sox eventually traded him to the Rangers in an August waiver deal that year. Rios hit .278/.324/.432 (105 wRC+) in 2013 and .280/.311/.398 (93 wRC+) in 2014. Not exactly “out them over the top” numbers. It wasn’t much of a secret Soriano would only accept a trade to the Yankees and Cashman tried to use that to his advantage. He waited the Cubs out until they lowered their asking price … then ownership jumped in and gave the Cubbies what they wanted, which was righty Corey Black. I ranked him as the team’s 18th best prospect right before the draft. Black has been hurt and ineffective since the trade, but still. Cashman was trying to get Soriano for nothing in particular and ownership jumped in to make the trade. Not great, Bob. It was the second time in less than a year ownership overruled Cashman. They re-signed Ichiro Suzuki against his wishes as well. Thankfully they decided to listen to Cashman when it was time to sell in 2016. Better late than never, I suppose. TUESDAY, 10:26am: The Yankees also checked in on Pence, writes Jon Heyman of CBS Sports, but as with the Reds, there doesn’t appear to be a match. Heyman says the Pirates and Rangers are also among the interested teams. The Giants alternated winning the World Series and missing the postseason from 2010-14 and 2013 was a miss the postseason year. Pence hit .283/.339/.483 (135 wRC+) that season and was an impending free agent, so the Giants got a bunch of calls about him at the trade deadline. They eventually re-signed him and won the World Series next year. The Yankees looked high and low for a right-handed bat in 2013 before getting Soriano. 5:47pm: The Yankees have contacted the Angels about third baseman Alberto Callaspo, according to Danny Knobler of CBS Sports. Knobler’s colleague, Jon Heyman, tweeted earlier today that Callaspo figures to be available as well. Knobler adds that the Angels “have made nearly everyone available” in trades. Callaspo, who was traded to the A’s at the deadline, hit .252/.324/.347 (91 wRC+) for the Angels before the deal. That would’ve represented a considerable upgrade from the .221/.290/.330 (71 wRC+) batting line the Yankees received from their third basemen in 2013. Good gravy. This 2013 team keeps getting worse and worse each time I look back at it.